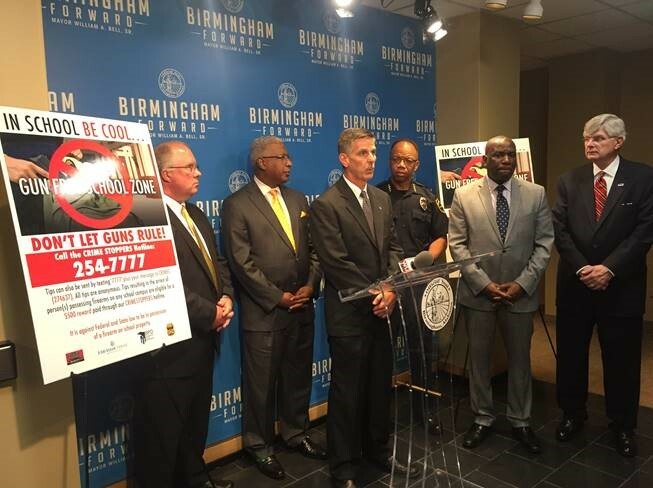 The Bureau of Alcohol, Tobacco, Firearms, and Explosives (ATF), Birmingham Police Department, Mayor’s Office and Crime Stoppers Metro Alabama today announced a new Gun Deterrent Initiative designed to keep illegal guns out of our schools. ATF in conjunction with the partners will be offering a $500.00 reward, thru Crime Stoppers, for any tip that leads to the confiscation of a gun on school grounds. “ATFs priority is to provide a safe environment for our communities to include the schools. These partnerships foster a positive environment for the education of our young men and women,” Steve Gerido, ATF Special Agent in Charge. “Any step to help protect our children is a step in the right direction. We are hopeful that this partnership gives students an outlet to speak up when they see guns, especially on school grounds,” said Mayor William Bell. Tips can be turned in person, via phone, via mobile app or even text. Information can be provided to the School Resource Officer, Crime Stopper at (205) 254-7777. Information can also be sent to ATF via the mobile app www.reportit.com by using the Birmingham field division as the location. Tips can also be sent by texting “7777” plus the message to CRIMES (274637). All tips are anonymous.